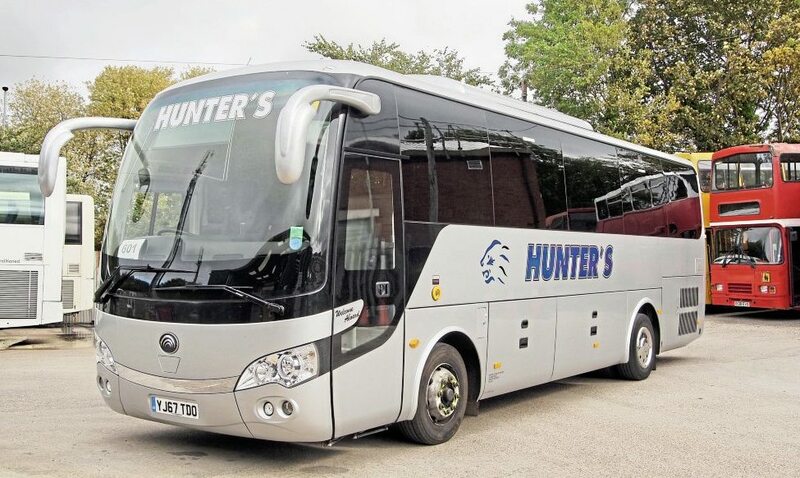 Known for its lion-themed livery, Daventry-based Hunter’s Coaches has turned 21. I was pretty confident when I started on my own. 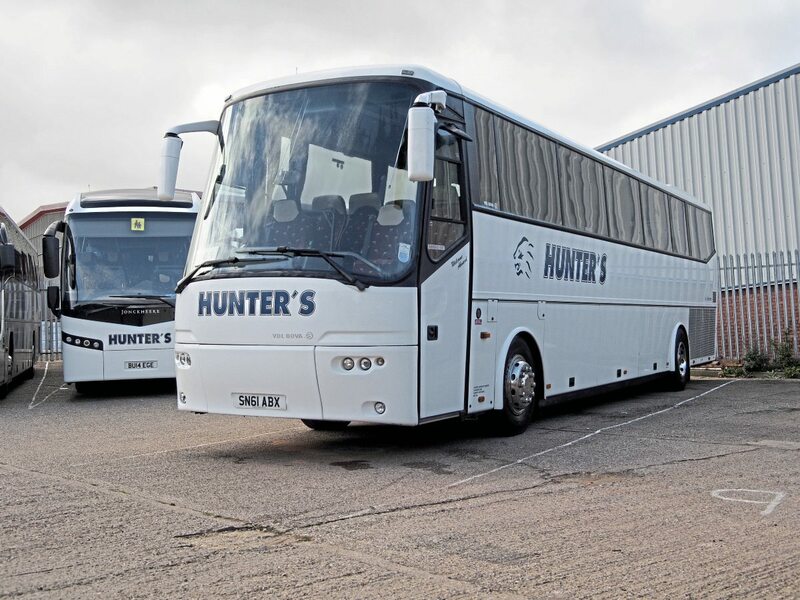 Hunter’s provides travel for the Cobblers, Northampton’s football team, as well as the Saints, the town’s rugby club. He also transports Liverpool FC supporters in the area to the squad’s home games. Hunter’s newer coaches tend to be used on Just Go and David Urquhart Tours trips. 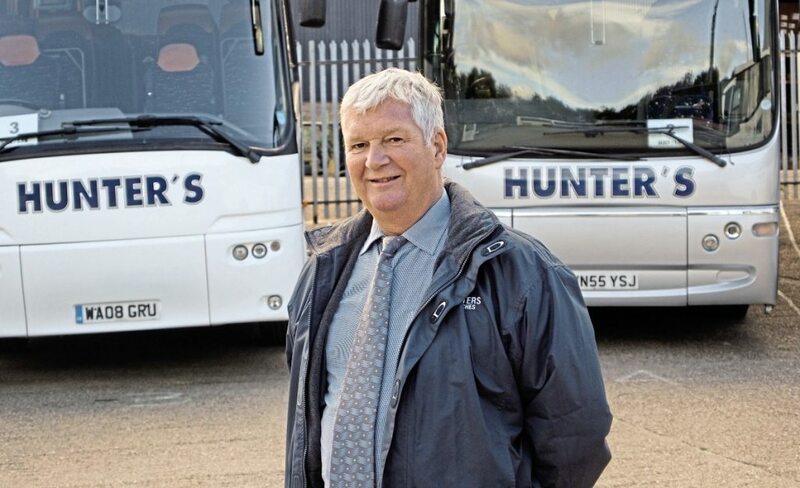 One of his drivers, Wayne Fitzpatrick, has been the David Urquhart Tours’ ‘Driver of the Year’ for the tour provider’s south region for three years in a row. Doing things for themselves seems to be the way to go for Hunter’s. 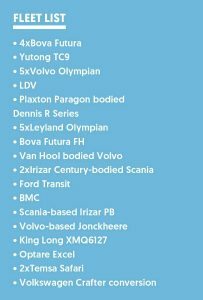 The company has its own team of mechanics and workshop with inspection pits, as well as a spray paint area. 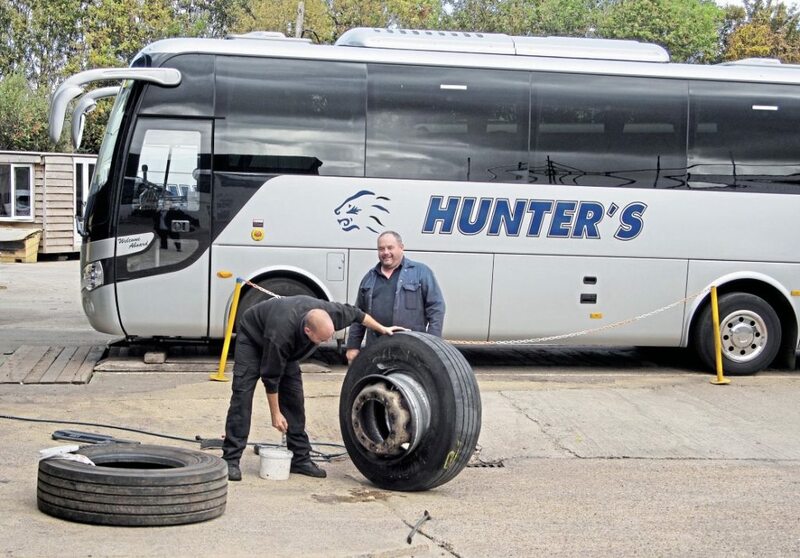 There are 26 staff at Hunter’s. On the subject of hiring drivers, he said: “I suppose it is hard to get them. A lot of people don’t want to bother these days. There isn’t the young blood getting into it. They don’t want to work the unsocial hours. And it’s not getting any easier. 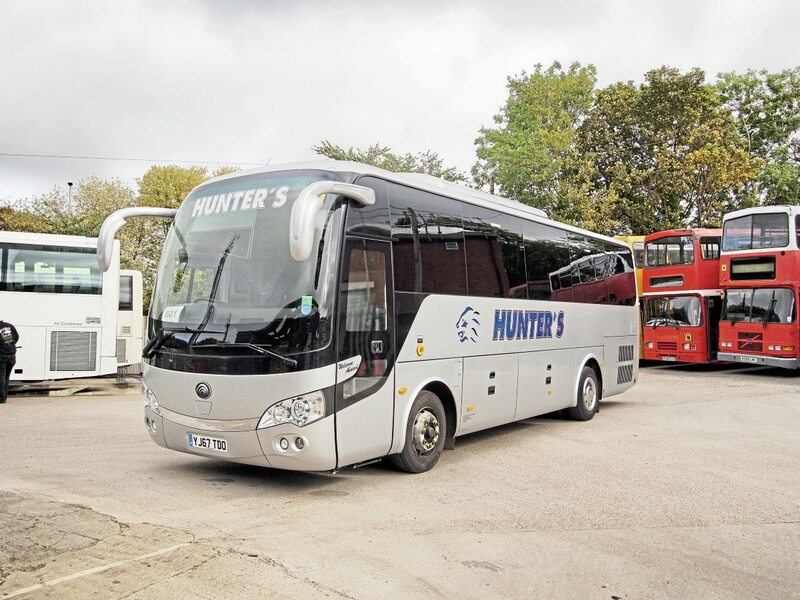 The new Temsa Safari was bought in celebration of Hunter’s reaching its 21st anniversary. At the same time it acquired it, Ray also took a second-hand one, exactly to the same layout. 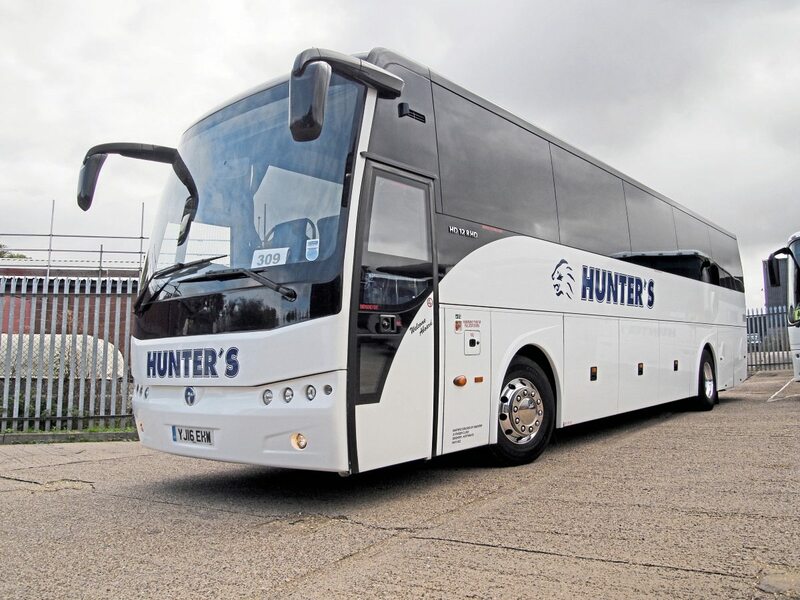 The 16-plate has 53 seats and a full executive specification. 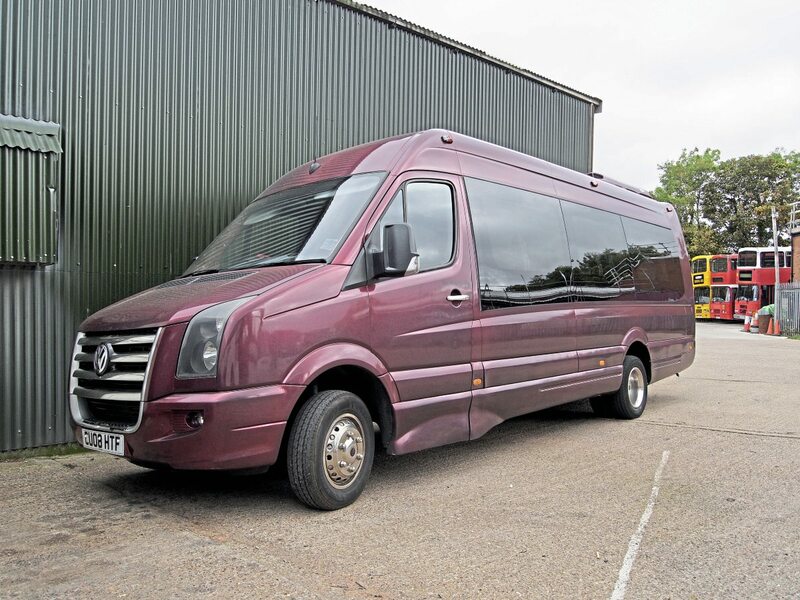 An unusual vehicle in Ray’s fleet is a 16-seater Volkswagen Crafter conversion. 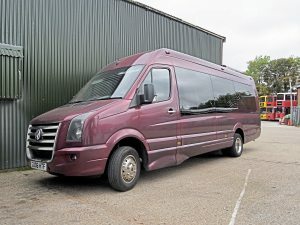 It is resplendent in a more showbiz burgundy colour compared to the white and occasional silver of the rest of the fleet; fitting considering the minicoach used to be what Welsh singer Charlotte Church went on tour in. 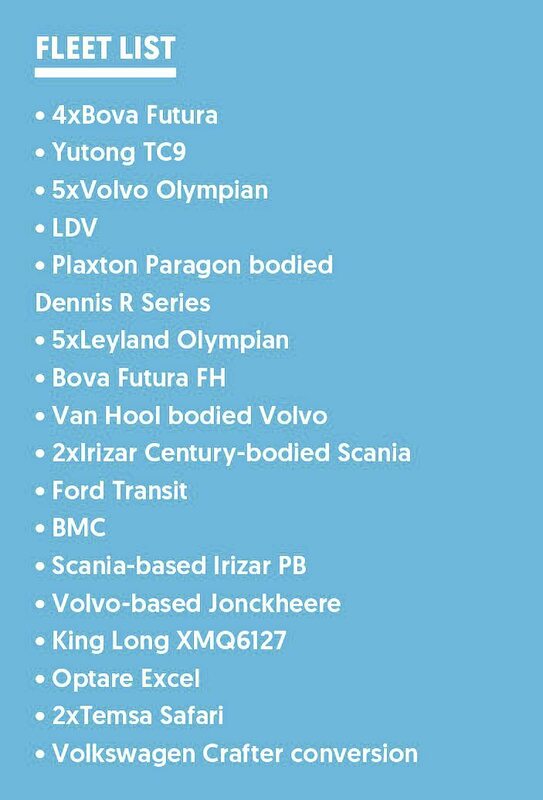 The age of the fleet varies from around the 2000 mark (with some of the older double-deckers, Leyland Olympians, from this time) to the present. 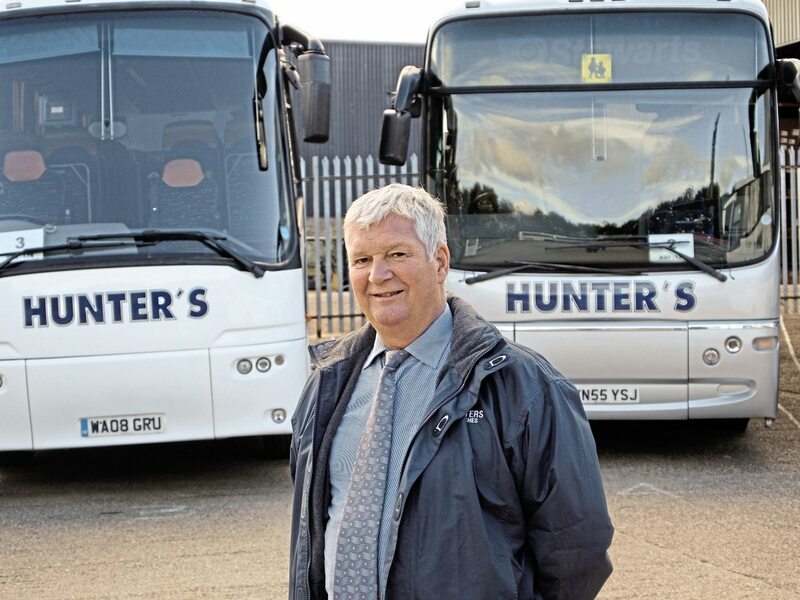 Hunter’s fleet of double-deckers are almost exclusively used on school runs, travelling often no more than 12 miles through the surrounding villages to transport pupils. In an interesting project, Ray has had one Olympian converted to have an extra three seats where the luggage pen used to be. 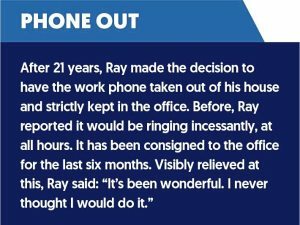 The work was done in-house, saving him the cost of a third party to do it. 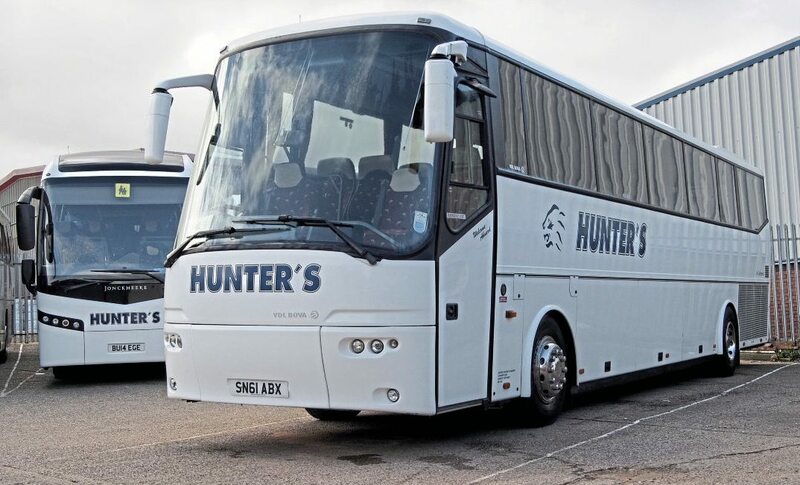 The coach was kept for six years in the Hunter’s fleet and was then sold to an operator in Northern Ireland. 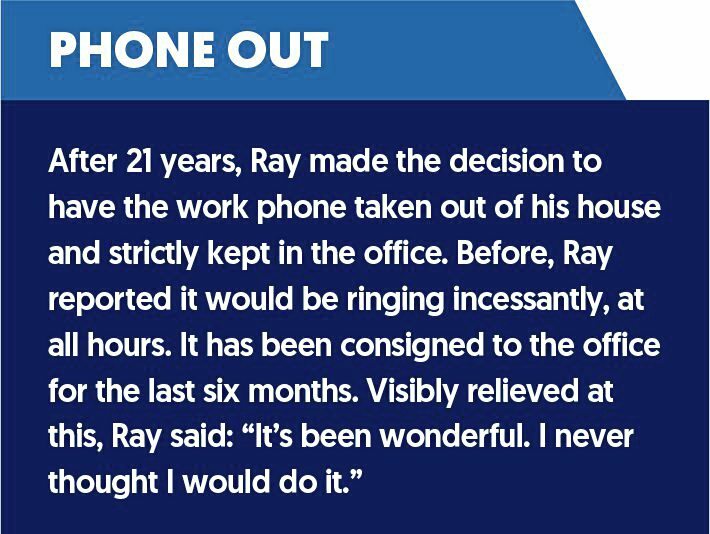 Ray reports he does sometimes sell vehicles second-hand, but sometimes part-exchanges them. What has he learnt over the 21 years he has been running the operation? “I’ve learnt not to cut corners. You were always tempted to in the early days. But now, for example, if I have to replace something I’m more likely to put a genuine part on; it lasts longer. He is certainly proud of what he has achieved over the 21 years. 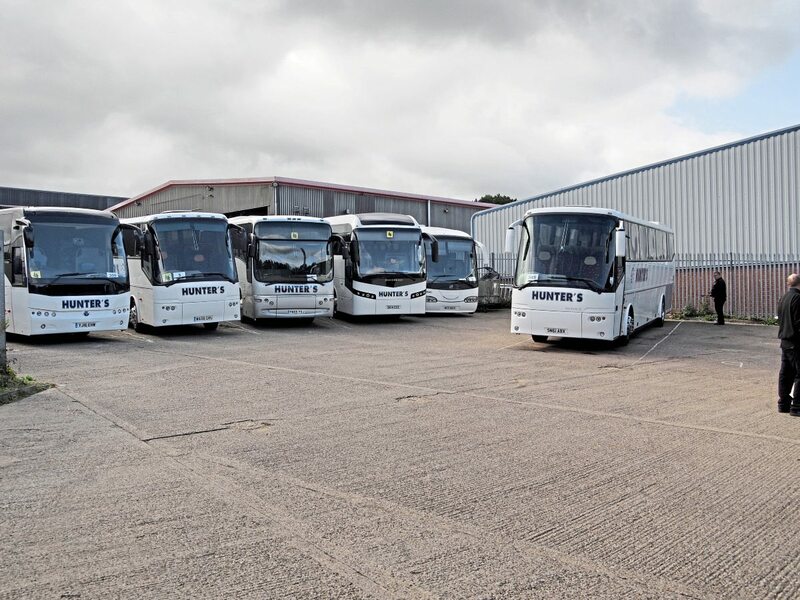 “There are some firms out there that have bought a lot of new coaches, and they can make you envious. But I look back and think, I’ve not done bad.